LIC Bhagya Lakshmi Plan (Table No. 829) is a new Term Plan introduced by Life Insurance Corporation of India as per new guidelines of IRDA. The Unique Identification Number of the LIC’s Bhagyalakshmi Plan is 512N292V01. This UIN no. should be quoted in all relevant documents provided to the policyholders. LIC New Bhagya Lakshmi Plan is a non-participating limited payment protection oriented plan with 110% of total amount of premiums payable on maturity are returned. Where the premium paying term for this LIC New Term Plan 829 is 2 years lesser than the policy term. The policy also pays out a death benefit to the dependents of the life assured in the case of his/ her demise. Micro Insurance is a special category created by IRDA to increase the coverage of insurance for an economically vulnerable section of society. Any life insurance policy with a sum assured of Rs. 50,000 or less is called micro insurance. LIC India has introduced this New Bhagyalakshmi policy for providing the distinct needs of the people with low income. The Key Features, Eligibility Conditions, Death & Maturity Benefits, Riders, etc. of LIC Bhagya Lakshmi Plan are mentioned in detail below. LIC Bhagya Lakshmi Plan is a new Micro Insurance Plan with Term Insurance Plan Features. Any life insurance policy with a sum assured of Rs. 50,000 or less is called Micro Insurance policy. And, Term insurance plans usually provides protection to your family in case of unfortunate and unforeseen circumstances. So, choosing these plans are the best option for those who wish to lead a stress-free life on their families. Below are the key features of LIC New Bhagyalakshmi Plan. The Bhagyalakshmi Plan of LIC is a non-participating limited payment protection oriented plan. It offers good life cover with low premium payments. Policy term will be the premium paying term plus two years, i.e., if the policy term is 5 years then the premium paying term is 7 years. If the death of the policyholder before the end of the policy term, then the insured family will receive Sum Assured as a death benefit. 110% of the premiums will be paid to the individuals on Maturity by excluding taxes and extra premium. Yearly, Half-Yearly, Quarterly, Monthly, or through Salary deductions are the different premium payment modes available for this plan. The Insured can revive the lapsed policy within a period of 2 consecutive years from the date of first unpaid premium (FUP). The Grace period available for premium payment in all modes is two calendar months, i.e., less than 60 days. If the death of the Insured occurs before the stipulated date of maturity, provided the policy is inforce by paying up-to-date premiums, then the nominee of the policy will get Sum Assured as Death Benefit. Where Sum Assured is the amount of money received along with the significant bonus at the end of the policy term. Provided the policy is in force, if the Life Assured survives till the date of maturity, then Sum Assured on Maturity shall be payable which is 110% of total amount of premiums payable during the term of the contract. Taxes and extra premium, if any, are excluded. A rebate is a discount in premium that the policyholder will get if he/ she pays the premium annually. There is only one rebate available for this LIC Bhagya Lakshmi plan 829, i.e., Mode Rebate. High Sum Assured Rebate is not available for this plan. A Rider is an add-on provision to any insurance policy because it provides additional benefits to the life assured at an additional cost. Generally, LIC India provides an accidental death benefit, Critical illness, and Permanent disability riders. But for this LIC Bhagya Lakshmi Plan (Table no. 829), there are no riders available. So, the individuals cannot avail additional benefits with this plan. The Customer can buy the LIC New Bhagya Lakshmi Plan from the LIC Agent or nearest LIC Branch Office. The Proposal form required to purchase the policy is available on the official website of Life Insurance Corporation. The Documents that are needed for buying the LIC’s Bhagyalakshmi Plan are as under. If the Insured is met with sudden accident or disability within the Policy Term or Maturity Period of Policy is completed, the Nominee can lodge the Claim. The Claim Forms can be obtained from Official Website of LIC India or from the LIC Regional Offices. The documents that are required during the Claim Process of LIC Bhagya Lakshmi Plan are listed below. Hence, you should collect all these forms before claiming this LIC’s New Bhagyalakshmi Policy. The Life Assured can calculate the minimum premium amount that has to be paid to take the Policy by using this LIC Bhagya Lakshmi Plan Premium Calculator. The Amount of Single Premium Paid will depend on the Sum Assured, Policy Term, and Age of the Insured. The LIC Bhagya Lakshmi Premium Chart is used to estimate the benefits offered by this LIC Micro Insurance plan 829. But you should enter some basic details like Name, Mail Id, Mobile Number, Age, Policy Term, and Minimum Sum Assured to calculate the premium value. Following are some of the sample annual tabular premium rates per Rs. 1000/- Sum Assured, exclusive of service tax. Loan: There is no loan facility available for this LIC Micro Insurance Plan Bhagya Lakshmi (Table no. 829). Surrender Value: The Individuals can surrender the policy at any time during the policy tenure provided the premiums have been paid. If the premium paying term is less than 10 years, then the premiums should be paid for at least two consecutive years to surrender the policy. If in case, the premium paying term is 10 years or more, then the premiums should be paid for at least three consecutive years to surrender the policy. Guaranteed Surrender Value is equal to Guaranteed Surrender Value factor multiplied by total premiums paid exclusive of taxes and extra premium. 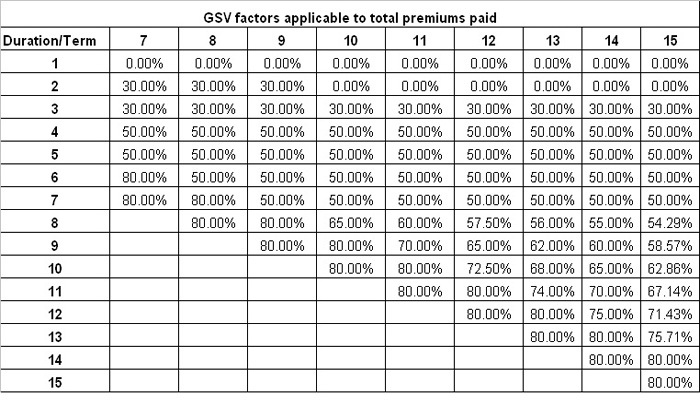 Go through the following table which illustrates the GSV factors that are applicable to total premiums paid. Tax: Taxes including service tax, if any, shall be as per the Tax laws and the rate of tax will be as applicable from time to time. The amount of tax paid must not be considered for the calculation of benefits payable under this LIC Bhagya Lakshmi Plan. Free Look Period: If the Life Assured is not satisfied with the “Terms and Conditions” of the policy, then he/she may return the policy to the Corporation within 15 days from the date of receipt of the policy stating the reason for objections. On receipt of the same, the LIC India will cancel the policy and return the amount of premium deposited. Grace Period: A Grace period of two calendar months but not less than 60 days will be allowed for this plan under all modes of payment. Revival Period: If the policyholder doesn’t pay the premiums within the grace period then the policy will lapse. But he/ she can revive a lapsed policy within a period of 2 consecutive years from the date of first unpaid premium but before the date of maturity. Provided the policy is inforce, if the policyholder commits suicide at any time within 1 year from the date of commencement of risk, then the Corporation will not entertain any claim under this policy except to the extent of 80% of the premiums paid excluding any taxes and extra premium. If the insured commits suicide within 12 months (1 year) from the date of renewal, then an amount which is higher of 80% of the premiums paid till the date of death or the surrender value, shall be payable excluding any taxes and extra premium, if any. 1. 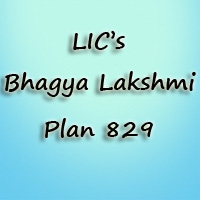 What is the Minimum Sum Assured for this LIC Bhagya Lakshmi Plan 829 ? Ans. The minimum sum assured under this New Micro Insurance Plan is Rs. 20,000. 2. When does paid up value/ surrender value will be received ? Ans. The Surrender/ paid up value accrues after the premiums for 2 full years have been paid for policies with a PPT less than 10 years. Whereas for the PPT greater than 10 years, then the Surrender/ paid up value will be received after the premiums for 3 full years have been paid. 3. What are modes of paying the premium for LIC New Bhagyalakshmi Policy ? Ans. The different modes of paying the premium amount for this Plan is Yearly, Half Yearly, Quarterly, Monthly, or through Salary deductions.